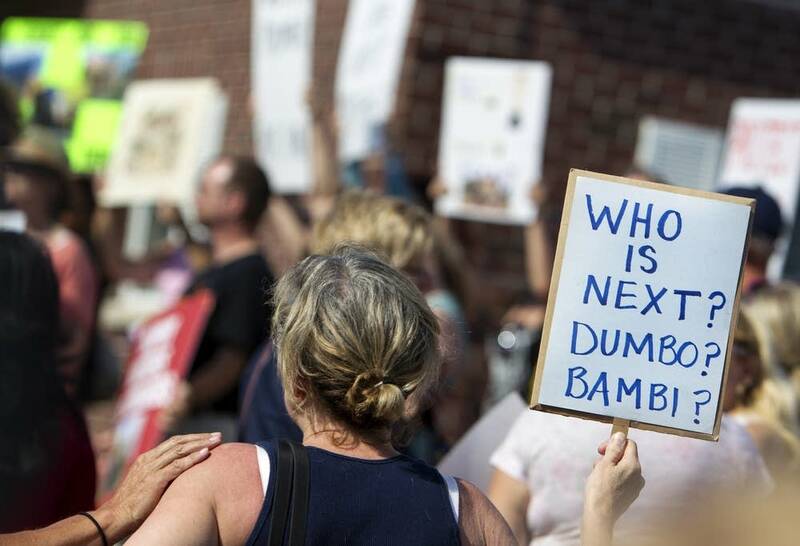 Outrage against a Twin Cities dentist who killed a protected lion remained at a fever pitch Wednesday, expressed both in online attacks and in protests outside his office. But the vitriol may not necessarily mean the end of his dental practice. The anger has been incessant since the news broke that dentist Walter Palmer allegedly lured a lion named Cecil out of a national park in Zimbabwe before wounding it with a bow and arrow. Authorities in that country say Palmer and his hunting party followed the feline for about 40 hours before killing it with a gun, removing its tracking collar, skinning and beheading it. Facebook, Twitter and the comments section of news sites erupted when the hunter was identified. 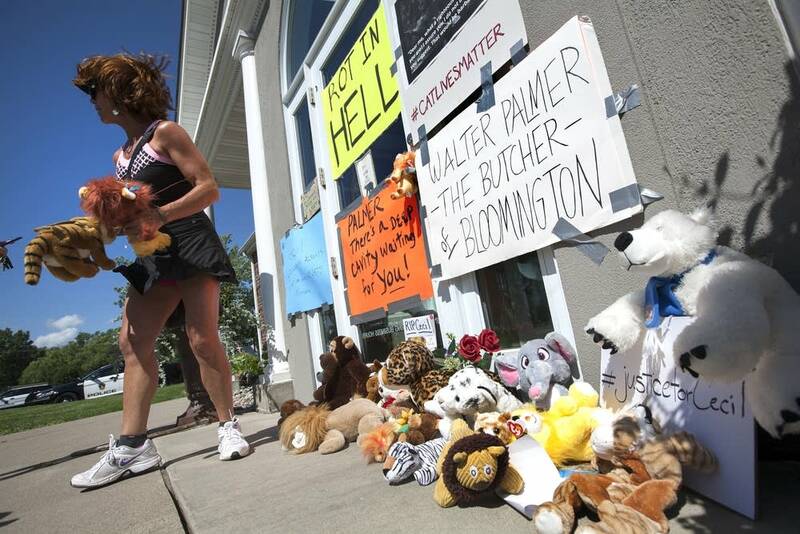 An online petition demanding "Justice for Cecil the Lion" drew hundreds of thousands of signatures. On Thursday, Eden Prairie police said they were monitoring Palmer's neighborhood due to "increased traffic" but weren't providing him personal protection. "Why are you shooting a lion in the first place? I'm honestly curious to know why a human being would feel compelled to do that. How is that fun?" Aside from a bit of name-calling, Kimmel's monologue was measured and polite compared with postings on the page for Walter J. Palmer, DDS, at Yelp.com, a business review website. Many users are calling for his prosecution. Others are posting profanity-laden ad hominem attacks, saying Palmer deserves the same fate as the lion. Yelp spokeswoman Shannon Eis said there've been thousands of these comments posted to Palmer's page. "This week, what we've experienced is the largest we've seen," she said. Eis compared the backlash against Palmer to the tsunami of hate unleashed against a Florida pizza shop owner in 2012 after he gave President Obama a bear hug, and the Indiana pizza shop owner who told a reporter earlier this year that she'd turn away some gay customers. Eis said Yelp was removing the comments on Palmer's page, using both its automatic filtering system and a team of live humans quick with the delete key. But she said the dentist's Yelp page would stay up. "You come here to figure out what you're going to experience when you go to a business," she said. "That's why we can't remove the page. This is a legitimate business. Our job is to protect the content on that page." For now, Bloomington police are keeping an eye on Palmer's office, which was closed as protests took place outside. Palmer himself declined to comment. But in a letter to his patients, the dentist said he hired several professional guides and "To my knowledge, everything about this trip was legal and properly handled and conducted." Palmer went on to express regret for the "taking" of the lion, and apologized for the disruption of his business. Given the barrage of negative publicity, one might assume Palmer has performed his last root canal. But Jim Lukaszewski, a Twin Cities-based crisis communications consultant, said that's not necessarily the case. Lukaszewski said public relations disasters, even monumental ones, rarely bring down businesses. Palmer could weather the storm, he explained, as the media discussion shifts from Palmer specifically to big-game hunting in general. "If he remains contrite, if he's cooperative, if he does the things that I think a person in his position should do, he'll become less and less the focus and the issue will become larger." Lukaszewski said that Palmer has been doing the right thing so far by expressing contrition. But to regain his reputation, Palmer will have to make amends publicly, Lukaszewski said. That'll likely mean resolving any criminal charges he may face in Zimbabwe. In his statement, Palmer said he'll assist authorities there and in the United States in any inquiries they make.